The WATTS ACV Pump Control Valve with Backpressure Feature is designed to minimize the surges associated with the starting and stopping of pumps, and automatically throttle toward closed when pump discharge pressure falls below an adjustable minimum, increasing backpressure against the pump. 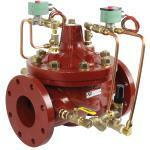 The valve opens at an adjustable rate upon pump start-up, and closes at an adjustable rate upon pump shut-off. When the valve is near closed a limit switch is tripped, turning the pump off. The pump starts and stops against a closed valve, and has provisions for manual operation in the event of power outages.